Cvijanovic, I., and K. Caldeira, 2015: Atmospheric impacts of sea ice decline in CO2 induced global warming. Clim Dyn, 1–14, doi:10.1007/s00382-015-2489-1. 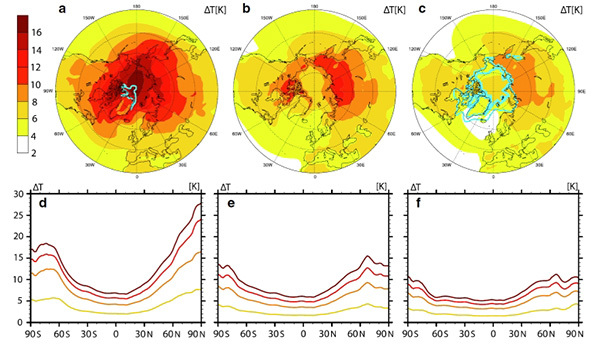 Changes in sea ice cover have important consequences for both Earth’s energy budget and atmospheric dynamics. Sea ice acts as a positive feedback in the climate system, amplifying effects of radiative forcing while also affecting the meridional and interhemispheric temperature gradients that can impact mid- and low latitude atmospheric circulation. In this study, we partition and evaluate the effects of changing sea ice cover on global warming using a set of simulations with active and suppressed sea ice response. Two aspects of CO2-induced sea ice changes are investigated: (1) the effect of changing sea ice cover on global and local temperature changes; and (2) the impact of sea ice loss on atmospheric circulation and extreme weather events. We find that in the absence of sea ice decline, global temperature response decreases by 21–37 %, depending on the sea ice treatment and the CO2 forcing applied. Weakened global warming in the absence of changes in sea ice cover is not only due to a decreased high latitude warming but is also a consequence of a weaker tropical warming. In the northern midlatitudes, sea ice decline affects the magnitude and sign of zonal wind response to global warming in the winter and autumn seasons. Presence or absence of sea ice cover impacts the intensity and frequency of winter extreme precipitation and temperature events (temperature minima, number of heavy precipitation days and number of ice days). For some of the analyzed extreme weather indices, the difference between the responses with and without sea ice decline is eliminated when taking into account the amplifying effect of sea ice loss on hemispheric warming. However, in other cases, we find the influence of higher order factors, exerting weaker but opposing effects than those expected from the global temperature increase.